For years experts have always been mesmerized by the fact that horses can lose 30 percent of their body weight, or more, and still recover and survive. They are the ultimate survivors! However, when a horse is in an abused or starved state of being, they are not very strong. In fact, they will have little muscle mass and be at more risk for breaking bones. To help a horse recover from a horrible experience such as this, there are several things they need. First and most importantly, they need loads of attention and love. Secondly, they need a good nutrition plan to help them gain back their lost weight and build muscle. As the horse begins to trust again, he or she will successfully be able to live a normal life. To start, offer a horse that is suffering massive weight loss some good quality hay. Quality of hay is important since you don’t want the horse to have any additional digestive problems. A good way to know how much hay to give a horse is to remember to provide hay that equals 2 percent of the horse’s body weight, each day. For an 800 pound horse, this would equal about 16 pounds of hay daily. If your horse is elderly, old or cannot chew properly, you may need to turn the hay into mash. Specialized feed for geriatric and mature horses may work as well. In addition, adequate water is necessary at all times. A good mineral or vitamin supplement is also helpful in rebuilding proper strength and health in a malnourished horse. You can get the supplements in block or granular form. After two weeks of the hay diet, you can try to introduce grain again. Grain should not be forced and should be given slowly. The reason it is important for the horse to be slowly re-introduced to grain is because their digestive system must re-adjust to eating grain. You can start with one pound of grain, two times a day. 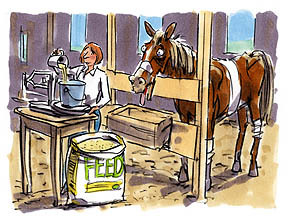 Once you think your horse can tolerate that amount, you can increase the grain by a pound a day. At the end, you should be feeding your horse grain that equals one percent of their body weight, each day and continue feeding hay as well. You must be patient when you are trying to put weight on a horse. It can take up to six months to see normal results. Be in regular contact with your vet and monitor the horse closely. Be sure to give the horse extra attention as well. Extra TLC can really help a horse recover quickly! The horse may be reluctant to trust humans, if he or she came from an abusive situation. So, give the horse time to adjust and be careful not to upset him or her. When your horse has gotten some of its strength back, you can start planning your next health care move for your equine. A vet can tell you exactly how much dewormer you should use the first time you treat the horse. In addition, a vet will also recommend a dental checkup when necessary and can check the horse’s hoof care. Read the next horse health tips article on Keeping Your Horse Cool.